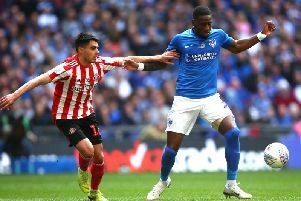 Portsmouth are sweating on the fitness of loanee Viv Solomon-Otabor ahead of the Checkatrade Trophy Final with Sunderland. The winger, who signed on loan from Birmingham City during the winter transfer window, has been limited to just six appearances during his spell at Fratton Park with the impressive form of Ronan Curtis keeping him out the side. But with Curtis having been hit by a freak finger injury, opportunity seemed to be knocking for Solomon-Otabor. However, the 23-year-old has now been handed an injury concern of his own after picking up a calf injury during Pompey's win at Walsall. The wideman is set to be assessed this week, but manager Kenny Jackett is now sweating on his fitness ahead of the trip to Wembley for the Checkatrade Trophy Final on Sunday, March 31. And Jackett admits he would be disappointed if his side were to lose Solomon-Otabor having been impressed with his contribution. "Viv’s a good player, in all of his games so far he has made a good impression," he said, speaking to The News. "A freak accident to Ronan and he was in at Walsall, making a big contribution towards winning the game. " "He is a talented player, a winger which fits into our system naturally with his pace. He gives us what we want in that wide area. " "If you look at the Barnsley game, he stood up Dimitri Cavare and then went past him and across him to win the penalty – that’s his strength. "Viv was disappointed with himself at Walsall in one-v-one situations, but it wasn't an easy pitch to run with the ball. "At Walsall, Viv had a few one-on-ones with their full-back, not many, and generally did a good job for the team."